7 Night Cruise sailing from Benoa roundtrip aboard Panorama II. Sailing from Benoa Port to Rinca island, experience the Indonesian archipelago on an island-hopping adventure. Relax on Satonda Island, a flooded volcano with a crystal-clear lake at its center; snorkel off Keramat Island and explore the colorful coral reefs below; stroll through the Komodo National Forest on the Islands of Komodo and Rinca and view the largest living reptile on Earth- the Komodo Dragon; bathe beneath a waterfall on Moyo Island. A cruise voyage unraveling the wonders of Bali from Benoa to Benoa.Cruise Highlights include: Rinca Island in the Komodo National Park and the Komodo dragons. Satonda Island and the salted water crater lake. Moyo Island, its luxuriant vegetation and virgin beaches. Lombok and its amazing diversity. Embarkation 4 pm – Sailing 8 pm. Arrive at Saringi Island at around 9 am. Saringi Island and Keramat Island are uninhabited and connected to each other by a sand bank. We will spend the morning going from one island to the other and enjoy a day of beach activities. Swimming, snorkelling, kayaking and stand-up paddle-boarding. Weather permitting we will enjoy a beach BBQ . Overnight at anchor. Morning sailing to Satonda Island. This spectacular island took its name from its dormant volcano and its extraordinary crater lake in its centre. The island is uninhabited and lush. Legend says the crater got filled after a tsunami caused by a nearby volcano explosion. Our walking tour will take you to the crater edge and to a lookout high on the island, the ideal place for spectacular photography. You will pass by ” wishes trees” decorated with fishing stone, shells and pieces of coral. Make a wish and leave your seashell or stone too. Later we return to the beach for a refreshing swim and snorkeling in this underwater paradise. At sunset, we will leave Satonda and sail overnight to Flores Island. Overnight at sea. Rinca Island is the refuge of the world famous Komodo dragon, a giant lizard measuring up to 11 feet in length and weighing in at over 300 pounds. More authentic than nearby Komodo Island, Rinca has more Komodo dragons and sighting are more frequent. Local rangers will guide this OPTIONAL EXCURSION through the habitat of the Komodo dragons who live on deer and wild pigs and buffaloes that share the island with them. Travelling in small groups with the guide and a park ranger, guests will make their way along paths that lead through pockets of thorny vegetation and dry tropical grasslands. We will walk approximately 2 hours along a trail and stop at the area’s most favorable observation point to possibly locate more Komodo dragon. By mid-day we will return to the jetty and re board to the zodiac and return to vessel. We will leave Rinca Island to sail to nearby Padar Island. We reach Padar Island’ Pink Beach – Snorkeling and beach activities. We can walk to an observation point and admire three of Padar’s magnificent beaches, one with black sand, one with pink sand and one with yellow. Evening sailing to Moyo Island. Overnight at sea. Moyo Island is hidden paradise which became famous after the visits of Princess Diana and Mick Jagger to mention some celebrities. It offers a beautiful pristine forest, waterfalls, rivers and grassy savannah. The ship’s zodiac will disembark guests at the village of Labuhan Haji and you will be greeted by local villagers performing a welcome traditional dance. The OPTIONAL HALF DAY EXCURSION starts with a walk around the village to witness daily activities of the local people and then continues with a hike to Mata Jitu waterfall passing through plantation of cashew nut. Look for beautiful red dragonflies, birds, and a huge array of jungle dwelling insects and spiders. The stunning Matajitu Waterfall are made of three waterfall levels and the last level is seven meters deep. Feel the quiet and peaceful atmosphere of the jungle. Back to Labuhan haji and return back to the ship. After dropping anchor in Pamenang Port, we reach the local dock by tender. Our OPTIONAL FULL DAY EXCURSION will take us to the North of Lombok. We will first reach the Malimbu cliff for a short break, to admire the panorama view of Gili Islands and of Bali’s mount Agung on the west. Our next stop will be at Tanjung traditional market. We will drive through lush paddy fields to reach the Senaru Village from where we will start our walks to the Sendang Gile and Tiu Kelep waterfalls. The falls lie 600 m above sea level beneath Mount Rinjani, a spectacular dormant volcano. The cool, fresh air and calm hill will provide a comfortable resting point. After lunch in a restaurant we will take a short visit to a Traditional Village, where mountain tribal life and traditions remain alive. We return to the ship in the afternoon and prepare for our farewell cocktails and Captain’s dinner. Late in the evening we sail to Bali – Benoa port. 6 am arrival in Benoa Bali – Disembarkation 6 to 9.30 am. 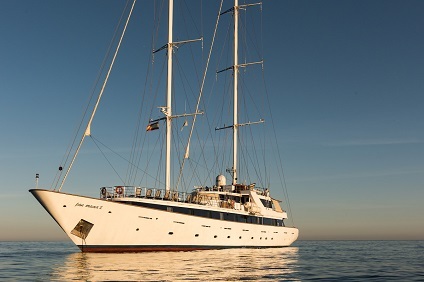 Discover a 2 masted state of the art sail cruiser which can accommodate up to 49 passengers in 25 cabins. Panorama II was launched in 2004 offering the highest standard of accommodation and comfort safety. The public areas include a main lounge with deep pile carpet and comfortable sofas. The aft area at the Upper deck provides generous semi covered or sun exposed areas and some magnificent views. The restaurant area at the Lower deck is the perfect setting for any of your meals, with generous buffet space and seating, while the swimming platform enables you to swim when weather and anchorage conditions permit. 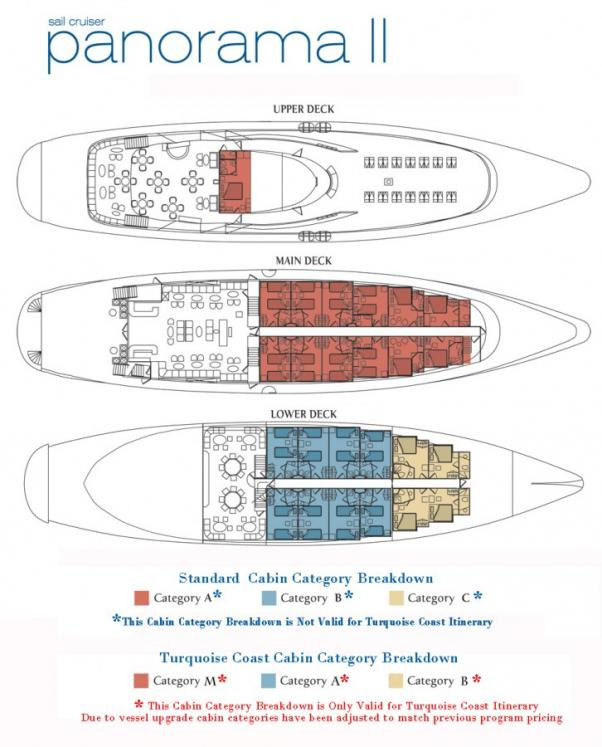 Experience the seas in Comfort & Style the Variety Way! Enjoy a sense of balance between famous destinations and unknown ports of call; a sense of balance between journeying and pausing; a sense of balance between excitement and tranquility; the right balance. If you are looking for that special touch of private yachting, with discreetly attentive service and relaxing contemporary sophistication, then Variety Cruises is the right choice for you. From the most lively and cosmopolitan to the most peaceful and pristine port of call, you are offered a truly unique opportunity to savor the great cultural, architectural, historical and natural diversity of the Mediterranean’s most varied and intriguing destination. Experience the seas in Comfort & Style the Variety Way! Our small ships allow our passengers to visit well known destinations or to discover unique and more private ports of call in a private, convivial and relaxed environment. Fine cuisine, with a strong local flavour, exciting itineraries blending well known ports of call and less know gems of the Mediterranean and personalized service have positioned the company as the choice for an ever growing number of cruise goers looking for a small ship cruise experience. 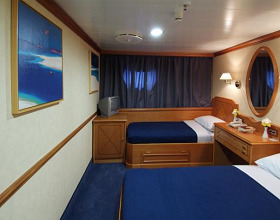 Category C (Category B on Turquoise Coast)* cabins are located on the lower deck offering portholes and bathroom with showers. The cabins are equipped with individual controlled A/C, piped music, TV (Satellite channels), telephone for internal use, mini safe box, mini fridge and hairdryer adapters (voltage: 220 V). 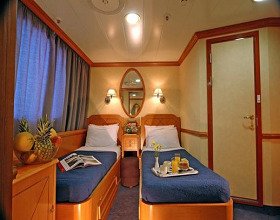 Category B (Category A on Turquoise Coast)* cabins are located on the lower deck offering portholes and bathroom with showers. The cabins are equipped with individual controlled A/C, piped music, TV (Satellite channels), telephone for internal use, mini safe box, mini fridge and hairdryer adapters (voltage: 220 V). 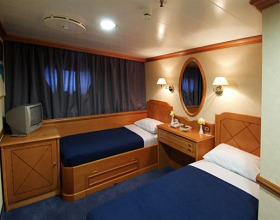 Category A cabins (Category M on Turquoise Coast)* are located on the main or upper deck offering windows and bathroom with showers. The cabins are equipped with individual controlled A/C, piped music, TV (Satellite channels), telephone for internal use, mini safe box, mini fridge and hairdryer adapters (voltage: 220 V).